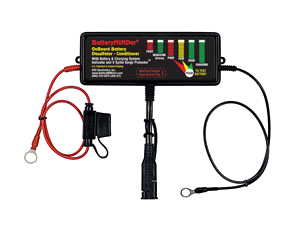 The BatteryMINDer low-amperage trickle Charger-Maintainer-Desulfator extends the run-time, range and performance of new and older batteries considerably longer than that provided by the standard high-amperage cart “bulk” charger, thereby ensuring your batteries stay fully charged and free of sulfate for months at a time. The BatteryMINDER is very useful for your cart batteries whether it is used on a normal daily basis, or, especially when the cart is left unattended for long time periods during the hot Florida summer months. Use of the BatteryMINDer can be expected to increase battery life and performance when used as directed on new batteries. Older batteries will also see significant life and preformance improvement depending on their age and condition. 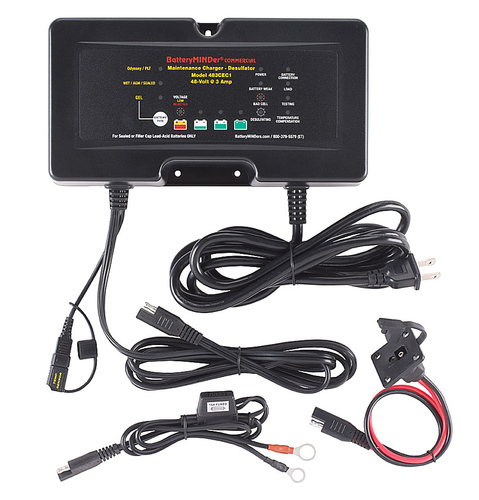 The price for the 48 volt BatteryMINDer Charger-Maintainer-Desulfator is $295 installed, plus tax. Provides a safe long-term low-amperage maintenance trickle-charge to all 48-volt battery systems, without overcharge. Works in tandem with the carts’s high-amperage “bulk” charger, and, it automatically remains “ON” when the bulk charger stops, keeping the batteries fully charged and it also automatically removes sulfate-crystal sulfation on the lead-plates for safe, long-term performance and care. Isolates batteries from potential damage caused by power surge lightning strikes. Exclusive temperature sensing and auto-regulating of the output voltage of the charger to ensure against over or under charging of your battery over a wide range of ambient temperatures. Auto-restart if power outage occurs. Turns “OFF” if faulty battery detected. Reduces water usage, especially during long-term storage, caused by electrolyte stratification. Qualifies for Energy Star and California Applicance Efficiency Standards for battery chargers. Safe to leave “ON” when unattended for long, extended time periods. Automatic full-time high frequency pulses dissolves sulfate from any sealed or wet cell lead-acid battery. 5-year “no hassle” warranty and industry exclusive 1-year 100% parts and labor money back guarantee! As batteries age, they gradually build-up a layer of lead-sulfate crystals (sulfation) on the lead plates. This sulfation also occurs during long periods of no battery charging particularly in hot temperatures. Connecting a desulfator to the batteries sends high-frequency electrical pulses into the lead plates which converts lead-sulfate crystals back into the sulfuric acid needed to provide for maximum charge of your aged batteries. Batteries which have been unused for long periods of time with no charging and have a build-up of sulfation are prime candidates for using a BatteryMINDer desulfator. The price for the BatteryMINDer Desulfator is $99 installed, plus tax.